Sienna Hwang had her first cannelé when she was a young girl traveling with her father during a business trip to Bordeaux, France, where the caramelized delicacy originates, and has been in love with the French pastry ever since. Sienna was fascinated by the petite dessert and its unexpected taste and texture consisting of a crunchy shell with a smooth and custardy center. In 2008, during a trip to Japan, Sienna was reminded of her love for the pastry. She noticed that many of the bakeries she came across sold cannelés only and that as a former colony of France, Japanese bakeries had a significant amount of French influence. 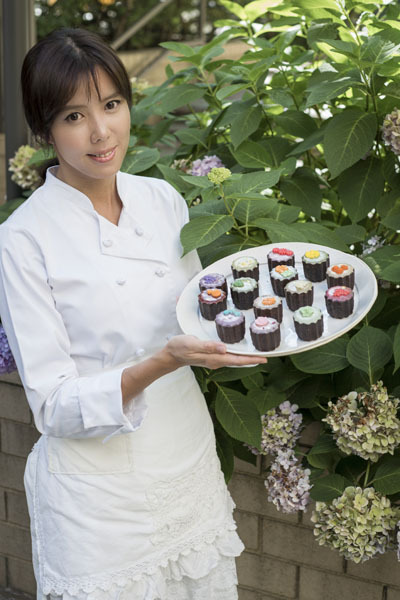 She then studied and learned the art of baking cannelés from a Japanese baker for a couple of months before returning to New York and practicing making the dessert in her own kitchen for a couple of years. Sienna was a Korean runway model and learned of the New York modeling scene from some of her Korean modeling friends who lived in the city. She came over to the United States and modeled on the stage for a couple of years; when Sienna was not busy modeling, she would practice baking cannelés in her apartment. As a model, Sienna has always watched her weight and felt that if she is going to eat dessert, it better be delicious and worth it; that is how she developed a passion for baking, specifically the cannelé. Sienna started baking professionally three years ago and currently runs her business—Cannelé De Sienna out of her home, but hopes to one day have a team and a storefront. She is known for her modern and contemporary decorations, which make her craft stand out from traditional cannelé. Her business is word-of-mouth and referral-based. Clients love the gluten-free and nut-free desserts for parties, special occasions, holiday gifts and party favors. Sienna enjoys putting a smile on her clients’ faces and encountering different kinds of people she may not ordinarily have the opportunity to meet without her business. Sienna creates delicious pastries with fresh ingredients and Japanese-inspired flavors. Some of the many flavors offered include: mango coconut, vanilla and rum, yuzu (Japanese citrus) green tea, earl gray lavender, raspberry pistachio, rose tea, and double melon, which combines honeydew and cantaloupe. Sienna is also developing more savory flavors such as basil and vanilla bean. Cannelé De Sienna are individually packaged in small clear boxes that beautifully display the pastry as a work of art. For any order inquiries, please email [email protected].